Are you looking to decorate your daughter’s room with unique wall decor? Read on! 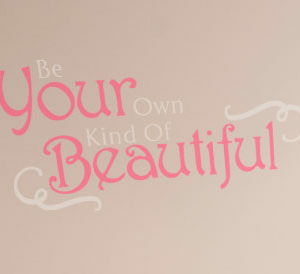 ‘Be Your Own Kind Of Beautiful’ wall words are perfect for her! She is growing and discovering her style. These wall letters tie in to the rest of the accents in the room: rugs, pillows and the clock on the wall! We had them applied on the wall adjacent to the bed. They look great between the windows on either side of the wall! They will be a constant reminder to your daughter on the need to set the standards by accepting how she looks and not following the crowd. How precious! At WiseDecor, we have wall lettering that gives your walls decor oomph! They are available in different colors, style and size. This enables you to choose wall words that fit in with your decoration style! You may also submit a quote that you would want to use but we do not have. Our designers will work with them: you will end up with quality wall decals! Application is easy! Simply peel the back sheet and stick the adhesive side of the lettering on to the wall. We pre cut and pre space them so that you do not have to do a lot to have stunning wall decor! Get in touch. Let us help you decorate with character building wall words!